Bundesliga | Bayern-bound Niklas Süle: The next Franz Beckenbauer? 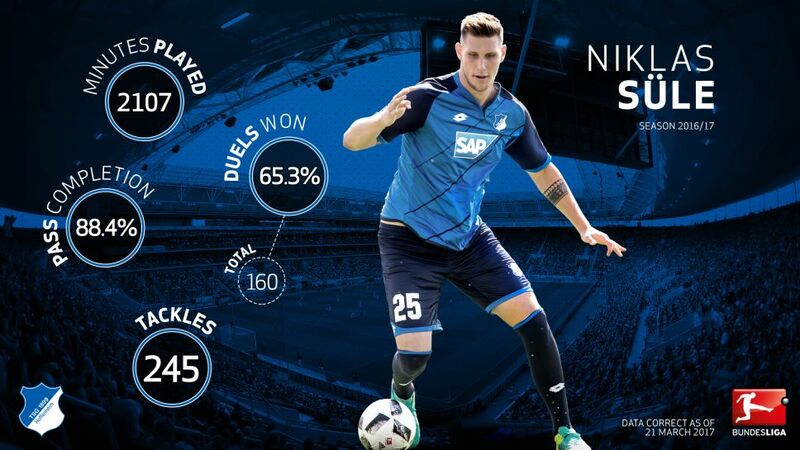 Bayern-bound Niklas Süle: The next Franz Beckenbauer? Niklas Süle and Franz Beckenbauer in the same sentence? A premature comparison, perhaps, but there is mounting evidence to suggest a likeness between the Hoffenheim youngster and the Bayern Munich and Germany legend is growing ever more justified. Given that Bayern already have two of the best ball-playing defenders in the game - World Cup winners Mats Hummels and Jerome Boateng – in their squad, with Javi Martinez, Joshua Kimmich and David Alaba also able to play in central defence, there is obviously something very special about Süle that prompted Carlo Ancelotti to sign him. One of the clearest indications of his ability arrived during Hoffenheim's 1-0 victory over Bayer Leverkusen last weekend, when Süle finished the 90 minutes having completed 97 per cent of his 137 passes – a league record since data collection started in 2004. Furthermore, he had 149 touches of the ball, which was more than twice that of the nearest Leverkusen player, and cut a composed figure in bringing the ball out from the back. Remind you of anyone yet? Indeed, being involved in the build-up is a part of the game the player himself enjoys. "It's a nice feeling when you have a lot of possession," he said at the weekend. That will certainly stand him in good stead when it comes to vying for a place in Bayern's star-stacked line-up, a prospect he is clearly relishing. "I try to do my own thing. but I like looking at players and learning from those who have reached where I want to be, like Hummels and Boateng," he told bundesliga.com earlier this season. An additional weapon in Süle's armour is his positional flexibility. He was at the centre of a back-three against Leverkusen, in the middle of a back four on Matchday 24 and on the right side of a back-three against Ingolstadt on Matchday 23. He is also able to play in midfield, while he cut his teeth in the game as a striker at youth level – as did Beckenbauer. And as if all that were not enough, Süle also boasts the more traditional characteristics defenders require. Standing at 1.95 metres tall and weighing 97 kilograms, he is an imposing physical presence who has won over 65 per cent of all challenges contested this term. Little wonder, therefore, that Hoffenheim have kept nine clean sheets in the Bundesliga in 2016/17 and have the tightest backline (25 conceded) in the division after Bayern: All of which has contributed to the Frankfurt native earning his first senior cap for Germany this season, while he was also called up to the current squad by Joachim Löw during the March international break. It seems safe to say, then, that Bayern are well set to continue their long tradition of fielding ball-playing, Germany international centre-backs.